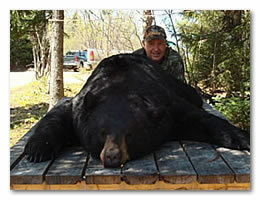 5-day guided black bear hunt with meals, lodging, airport pickup, taxes, export permit and trophy care. 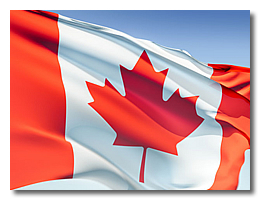 Click here for information on our Newfoundland bear hunt. 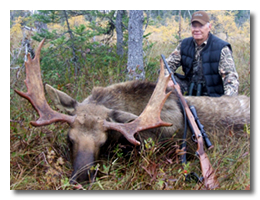 5-day guided moose hunt with meals, lodging, airport pickup, taxes, export permit and trophy care for $3,800. Click here for more information on our Newfoundland moose hunt. 5-Day Guided Woodland Caribou Hunt with Meals, Lodging, Airport Pickup, Taxes, Export Permit and Trophy Care. Call or email us for more information. This modern lodge provides all the comforts of home with electricity, hot and cold running water, multiple bedrooms and bathrooms, kitchen, dining and living areas. You can even do a little fishing in Newfoundland. Email us for additional lodge and hunt area photos. With the right people in Canada, a beautiful lodge and plentiful game, we have enjoyed many years of success in Newfoundland. Let us show you. Click here to view some success photos from our Newfoundland big game hunt. Sometimes we get a cancelled hunt and we offer the hunt at a discounted. You can sometimes save a little money if you can go on short notice. Click here to view some of our last minute hunts, cancellation hunts and discounted hunts.